Mar 9, 1943 Chicago, U.S.
Bobby Fischer was a lone genius who took on and defeated the might of the Soviet chess machine. He won the World Championship title in 1972 at the age of 29 after defeating Boris Spassky in the most-publicised match in chess history. Sadly that was effectively the end of his career, as the American became a recluse who didn’t play another serious game for the next two decades. Fischer first stunned the chess world as a 13-year-old prodigy when he defeated IM Donald Byrne in what was dubbed the “Game of the Century”. A year later he won the first of his eight US Championships, qualifying him for the 1958 Interzonal Tournament in Yugoslavia. Little was expected of the young star, but his top 6 finish earned him a place in the final World Championship qualifier and the grandmaster title. He remained the youngest ever grandmaster until Judit Polgar broke his record thirty years later. The 1959 Candidates Tournament was a step too far for the 16-year-old Fischer, who lost all four games to the eventual winner, Mikhail Tal, but three years later he was one of the favourites after winning the 1962 Interzonal by a clear 2.5 points. Instead he finished a long way behind the winner, Tigran Petrosian, and complained of collusion among the Soviet players in an article published in Sports Illustrated. During the 1960s Fischer often withdrew from events and went long periods in which he barely played, but the level of his chess continued to rise. His ferocious will to win, deep preparation and crystalline play made him arguably the strongest player in chess history, and after turning 23 in 1966 Fischer finished first in every tournament or match he played. His final ascent to the chess throne was the stuff of legend. He dominated the 1970 Interzonal in Palma de Mallorca, then whitewashed both Mark Taimanov and Bent Larsen 6-0 in an unprecedented run of twenty consecutive victories against top opposition. Petrosian could only restrict the score to 6.5-2.5 as Fischer qualified for a World Championship match against Boris Spassky. What became known as the “Match of the Century” took place in Reykjavik and played out against the backdrop of the Cold War. It could have ended in a damp squib when Fischer forfeited the second game and might well have forfeited the match if his opponent hadn’t been willing to make concessions. Instead it was a long-awaited coronation for Fischer, who won 12.5-8.5. Fischer inspired a chess boom in the US and seemed to have the world at his feet, but instead he slipped into obscurity. His terms for a match against Anatoly Karpov were rejected by the World Chess Federation and he conceded the title in 1975 without playing another game. Although he briefly returned to the limelight to play a rematch against Spassky in 1992 his comfortable win was overshadowed by becoming a US fugitive due to the sanction-defying decision to play in Belgrade, Yugoslavia. In the years that followed Fischer made headlines for rants against the US and Israel, displaying anti-Semitism that perhaps dated back to a troubled childhood when he was raised by his often absent Jewish mother. The champion was arrested in Japan in 2004 on a US warrant, but was granted asylum in Iceland, where he spent the last three years of his life. The last lone wolf "World Beater", and the greatest ever because of the distance between his ELO Rating and his nearest competitors is the widest of all time. 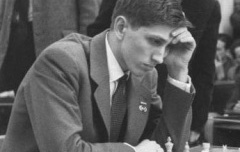 Since Bobby Fischer, who stepped into chess history alone, all top players have had either computer assistance, support teams of Grandmasters, or most usually a combination of the two. Fischer was a lone genius, and the last of his kind.